On my own blog, The Perpetual Page-Turner, I had a "YA's Got Talent" list full of talented characters in YA. I have a couple on here from that list but more! I am always so jealous of people who are super talented because I just have never been really GOOD at anything unless you count binge eating cookies, world class procrastinating or marathoning shows as a special talent? 1. Mia/Adam // If I Stay & Where She Went by Gayle Forman: Mia is an incredible talented musician as is Adam! These books are favorites and the movie is coming out soon sooo you should probably just get to this if you haven't! 2. Carmen // Virtuosity by Jessica Martinez: Carmen is an incredibly competitive violinist...which a very competitive mother too! Also this is a great + underrated book! 3. Lucy // The Lucy Variations by Sara Zarr: A whole family of talented pianists but the MC has completely quit and learns to love music again on her own terms. 4. Hannah // Bunheads by Sophie Flack: The world of competitive ballet! Such a good book and also underrated. Written by an ex professional ballerina. 5. Zoe & Olivia // Maybe One Day by Melissa Kantor: Another dancer! Also, very good friendship story! 6. Elise // This Song Will Save Your Life by Leila Sales: I know teenage DJ might sound a little lame but I PROMISE YOU. This was one of my FAVORITE reads of last year! 7. Cath // Fangirl by Rainbow Rowell: Cath is a really talented writer of fan fiction (and just in general) and she's pretty internet famous! 8. All the characters // Take A Bow by Elizabeth Eulberg: It's set in a performing arts high school and has a couple different POVs who are all talented! 9. Lola // Lola and the Boy Next Door by Stephanie Perkins: Fashion designer! 10. Matt Finch & Dee // Open Road Summer by Emery Lord: FAMOUS SINGERS. Matt Finch forever! And Lilah = a Taylor Swift-esque singer but when she was still country. So..have you read any of these? Also, please tell me more recs of very talented characters so I can live vicariously through them!! I love so many of these! I've been meaning to read Bunheads for awhile, but hadn't heard much about it. Glad to hear it's worthwhile! I like your topic. I hadn't really thought of this before. When I read books about really talented kids I wonder if my students can relate to them. That's a great topic! One of my all time favorite talented characters is Anne Shirley from Anne of Green Gables - she was a writer! Is it bad that I haven't heard of any of these characters? I need to catch up on reading. If you don't mind adventurous kind of talent, Day from Marie Lu's Legend Trilogy is pretty talented at all things parkour. I love your pick this week, I love talented characters and now I am so jealous that I didn't think of this! Great list! Oh, Bunheads sounds great, I'll check that out! Great list Jamie! I agree with you that Virtuosity is completely underrated! I really enjoyed that book. Great list! I didn't know Take a Bow was set in a performing arts school! Looks like I need to bump it up on my TBR! And I'm ashamed to say I've had Bunheads on my shelf since it's release... If it's loved this much maybe I should finally get to it! I'm not creative and used this theme as well, lol. Anyway, I'd have to agree with Mia and Adam. I totally forgot Zoe and Olivia! And Lola! Cath's on my list this week as well. I'll have to check out these other talented characters! I had a lot of fun with this theme. I chose the Top Ten characters I Admire. 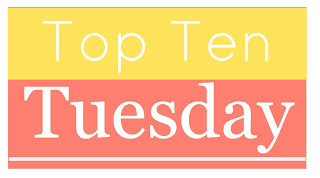 For this week's TTT, I chose to write about 10 unforgettable female characters. I'd add Andi from Revolution by Jennifer Donnelly, a talented guitarist, Butter from Butter by Erin Jade Lange who is a talented saxophonist, and the two characters from Guitar Notes by Mary Amato, whose names I can't remember. Like Mia and Adam, they're talented, and play cello and guitar. I was wondering why I wasn't getting any visits today -- then realized that I forgot to add my link! Great list and good choice for "X." I would add Cinder from Marissa Meyer's book -- talented mechanic. For another talented mechanic, although a secondary character, I like Maddie in Code Name Verity by Elizabeth Wein. Cool choice of topic! I don't know if I could come up with 10 talented characters (which may be why I'm so frustrated with the books I've read lately). Great list! Suggestions: Katniss (archery) and Will Treaty (archery and Rangery stuff). I loved this topic idea! I did my post on characters affected by mental illness. I tried to add my post to the Linky but it said the registration had expired?